Mumbai: The rupee dropped to a record low in opening deals on Wednesday as a sharp rise in global crude oil prices over the last two sessions weighed on sentiment for the local unit. The partially convertible rupee hit 73.34 per dollar in early trade, an all-time low, and sharply lower than its previous close of 72.91. 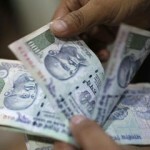 At 0335 GMT, the rupee was trading at 73.30. Markets were closed on Tuesday for a local holiday. The benchmark 10-year bond yield was up 6 basis points at 8.05 percent. Oil prices firmed on expectations of a tighter market once U.S. sanctions start targeting Iran`s petroleum industry from next month, although a strong dollar and rising U.S. crude supply curbed gains. Prices however remain at highest levels since November 2014.